On Wednesday evening, November 14th, representatives from the Diocese of Greensburg met with St. Peter’s leadership teams. Members of the parish finance, pastoral and building committees received a presentation from the Diocesan Chief Financial Officer (CFO), Sheila Murray, Vicar General Msgr. Larry Kulick and diocesan engineers to finalize discussions concerning the construction of our Social Hall/Rec Center. Ms. Murray provided a very detailed analysis of the construction costs and financing associated with the project. Msgr. Kulick spoke about Bishop Malesic’s support for the project but the desire for the leadership teams to be fully briefed on these matters. Following a robust discussion of the facts and figures presented by the CFO permission was given for the parish to move forward with construction of the facility. A letter of intent for the contractor must be drafted and signed before the process is finalized. Hopefully, that will be completed before our celebration of Christ the King. The Bishop will participate with parishioners in a ground breaking ceremony on December 16th at 1:00PM on the site of the St. Mary’s Church, School and Rectory. Please plan to attend! Thank you all for your support and patience throughout this long process. This is an artist’s rendering of the proposed parish center, which will be built on Church Street down the hill from the Historic St. Peter Roman Catholic Church in Brownsville. The Historic Church of St. Peter in Brownsville is launching a capital campaign called “Upon this Rock’’ for the construction of a multi-purpose parish center that will include a social hall as well as space for religious classrooms, recreation and offices. Plans call for the center to be constructed on parish-owned land on Church Street, adjacent to the current parish office building. Previous studies focused on building a parish center in the parking lot adjacent to the church but there wasn’t enough space. The proposed center will include a multi-purpose social hall that can accommodate up to 300 people, a kitchen and related facilities, meeting areas for parish organizations and ministries, five religious education classrooms as well as recreational and office space, according to a press release issued by the Roman Catholic Diocese of Greensburg. The Rev. 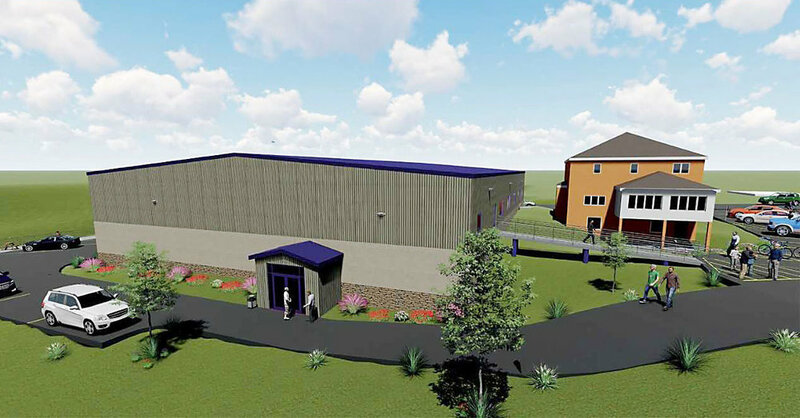 Timothy Kruthaupt, pastor, noted the recreation aspect will include high school regulation basketball, volleyball and indoor soccer areas. Officials hope the parish center will be a boost to Brownsville as it will be available for community activities. But he observed that new developments are taking place in Brownsville, such as completion of the Cast Iron Amphitheater in Snowden Square, new apartment building for seniors and efforts by Brownsville students to help the Brownsville Free Public Library. With plans for a new parish center, St. Peter Parish is hoping to do its part. “Part of our objective is to reach out to the broader Brownsville community,’’ said Kruthaupt. St. Peter recently completed a series of presentations about the proposed center that were attended by 150 parishioners. Many are volunteering to visit and speak with other parishioners about contributing to the project. Parishioners Mark Moncheck and John Harvey are co-chairing the capital campaign. The pastor said letters of support have been obtained from the Fayette County Commissioners, state Sen. Pat Stefano. R-Bullskin Township, and Rep. Pam Snyder, D-Jefferson. They have been published in recent parish bulletins. Kruthaupt said the parish already has over a million dollars in reserves and pledge commitments for the project but needs to have 80 percent of the project costs on hand to begin construction, estimating this goal at approximately $1.5 million. The parish also plans to apply for grants. Donations may be sent to St. Peter’s Building fund, 118 Church St., Brownsville, PA 15417. Donations to this 501(c)(3) nonprofit are tax deductible. "Tombstones can tell a story. 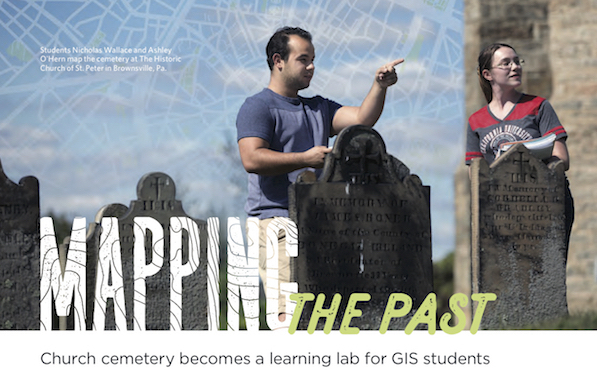 They why Cal U students created a digital map of the cemetery at The Historic Church of St. Peter in Brownsville, Pa."
Read more about this project on page 9 of the Fall 2017 California University of Pennsylvania alumni magazine, the Cal U Review. Published in the Uniontown Herald-Standard on Wednesday, June 24, 2015. Click on the headline to view the article. Despite the forecast for a major snowstorm, the Rev. Timothy Kruthaupt is once again in Washington, D.C., today for the 43rd annual March for Life, protesting the U.S. Supreme Court's 1973 decision that legalized abortion.